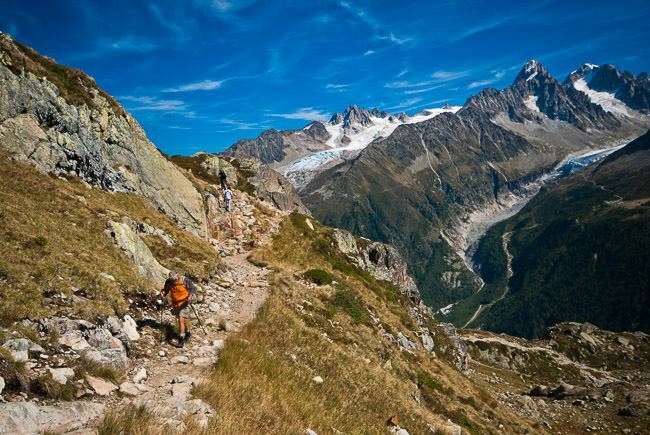 One of the world's great walking regions: superb mountain scenery, generally good weather in season, excellent huts or other accommodation, French food (albeit often of the tourist variety). In many ways the neighbouring Aiguilles Rouges are the best walking of all, not least for some amazing views back to the Mont Blanc massif. 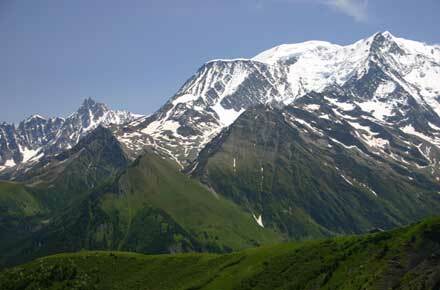 The area's supreme walk is the justly famous Tour du Mont Blanc. 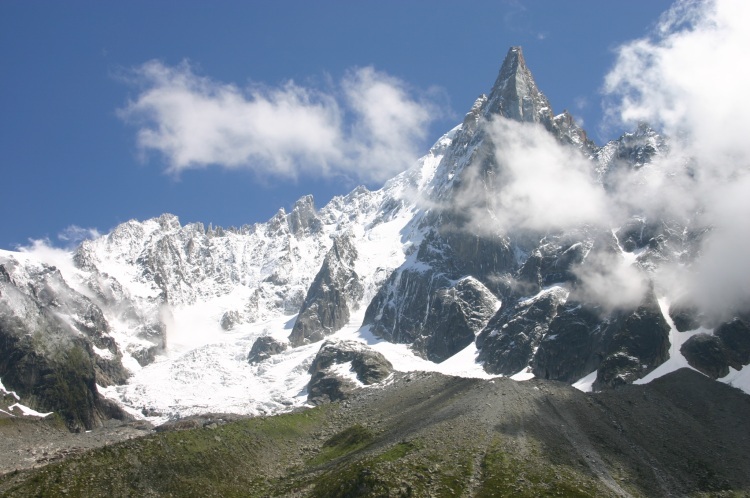 Other multi-day walks include the Tour of the Aiguilles Rouges. Life-enhancing day walks are endless. These can be tough walks in high, remote mountains. Come prepared. 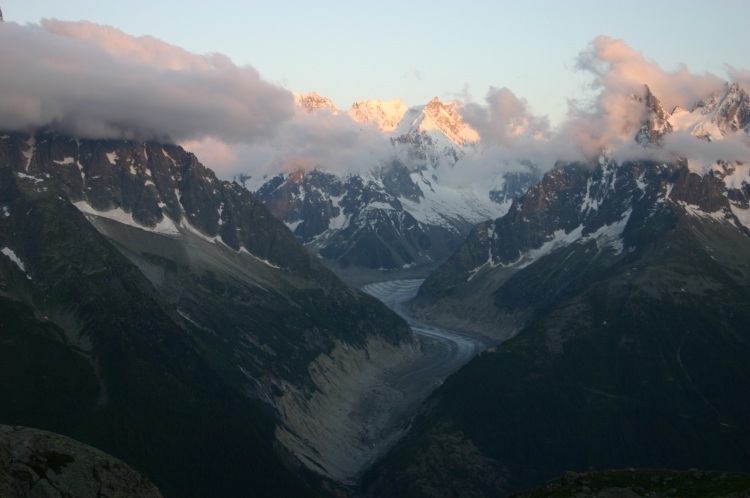 The Mont Blanc region is one of the world's great walking areas, with a myriad of varied walks in superb mountain scenery, with huge peaks and spires, glaciers galore, high meadows and comfortable (often atmosphere-starved) villages and towns in the deep valleys. Superb paths, plentiful huts and usually easy access to the delights of French and Italian cooking make this a paradise for walkers, albeit an occasionally damp one. See also the superb neighbouring Aiguilles Rouges. 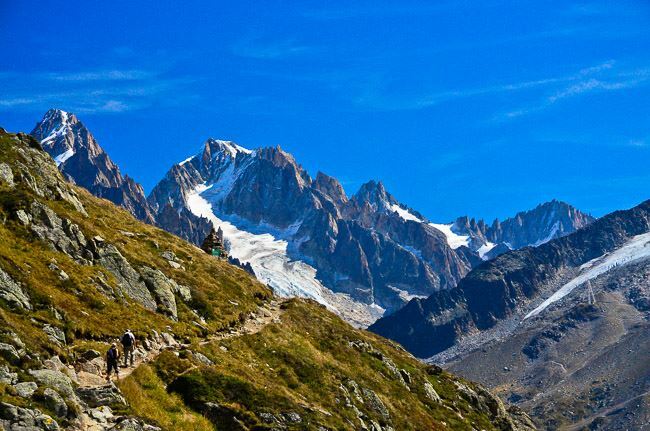 These are arguably even better walking than Mont Blanc itself - particularly if you want multi-day but less trodden walks. 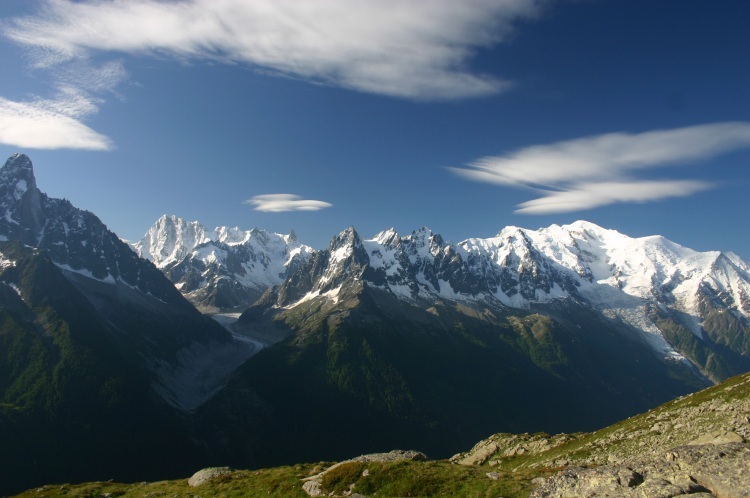 Around the dominating massif of western Europe's highest mountain (at 4,808m) is a ring of French, Swiss and Italian towns, perfect base camps for day excursions into the hills, or roadheads for longer treks. and other long-distance walks (it is easy to create your own with the good maps and plentiful refuges), the region has endless outstanding day walks and overnighters. 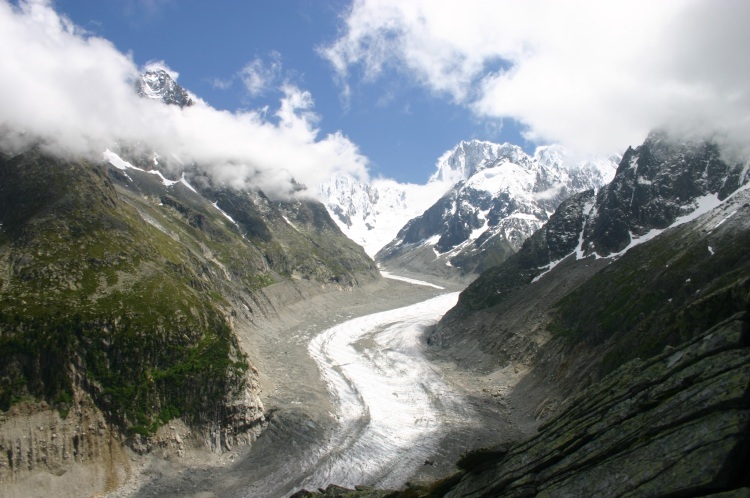 The must-take Cicerone book arranges the area's day walks by base towns: Chamonix, Argentiere, Vallarcine, Cormayeur etc, and we have arranged our walks following this logic. The selection is endless - don't just think of the walks here: your circumstances may mean other walks (the Cicerone features 50 in the region) give you even greater joy. You can find a myriad of walks, wherever you are, on the map of the area (although these tend to be adequately- rather than well marked). 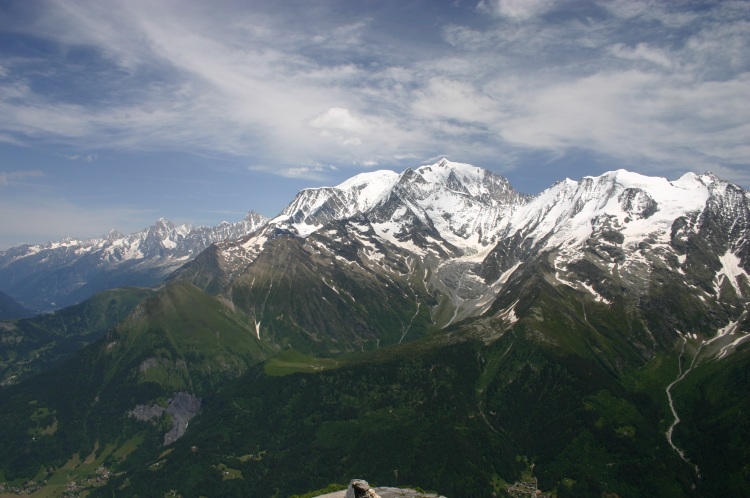 Mont Joly: Mont Joly is the high point of the next ridge west and has outstanding views back onto Mont Blanc and its glaciers. Col de la Fenetre: easy access to high ground and glorious views. Tete Nord du Fours - along part of the TMB. 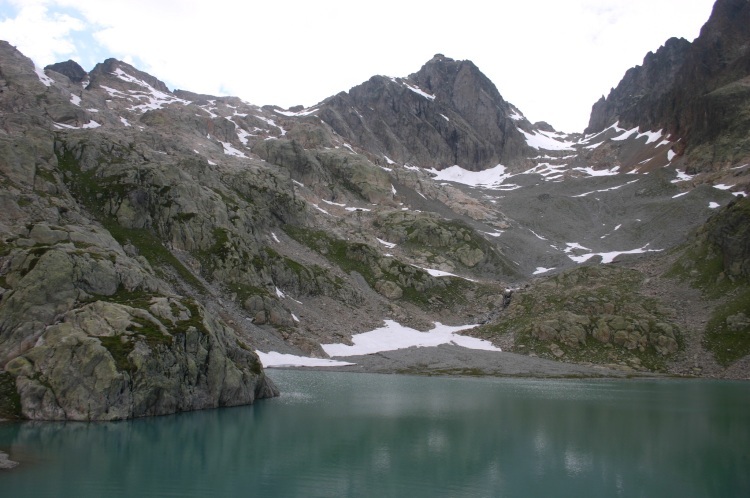 Lac Blanc and the Eastern Aiguilles Traverse and the south-eastern Aiguilles Rouges. Le Chapeau and Tete des Prepators: an easy path (family starter-walk) leading into a tougher ridge ascent. Superb glacier and mountain views. 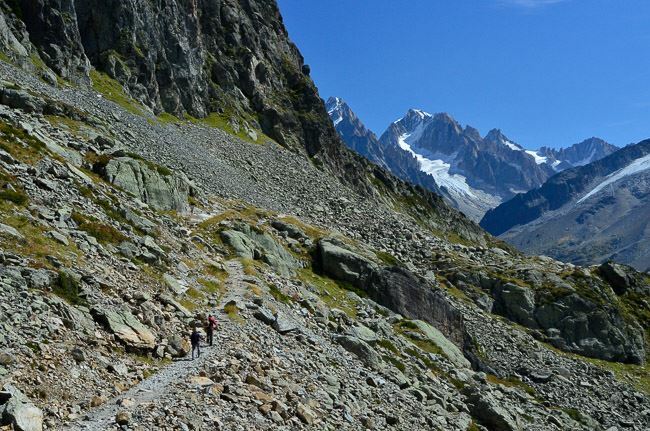 Grand Balcon Nord, a superb 2-hour climb to Signal Forbes, high above the vast Mer de Glace glacier, then a traverse across the Mont Blanc massif's northern slopes, high above the Chamonix Valley. 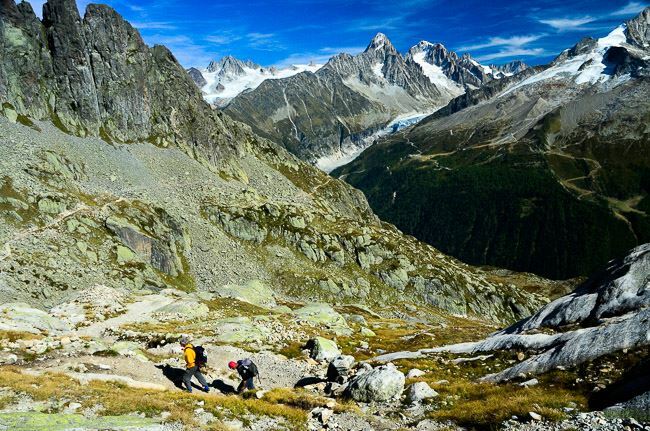 Montagne de la Cete: quite a tough but remarkable ascent of a ridge between two glaciers. Aiguillette d'Argentiere: a fine, long half-day circuit to a (lowish) nearly-needle, with the increased excitement of a short section of Via Ferrata. Aiguillette des Posettes: Cicerone says it: "perfection is rare in this world, but the Aiguillette des Posettes comes pretty close." Quite a long, steady climb to this peak on the Aiguilles Rouges side, but much of it is outstanding. Refuge Albert Premier: 4 hours of great walking from a cable car to this hut-with-a-view between a high Mont Blanc ridge and the Glacier du Tour. It is very popular, though. Croix de Fer: a wonderful summit-laden half day circuit on easyish paths from a cable car to a peak in Switzerland. Much less uphill slogging than most! 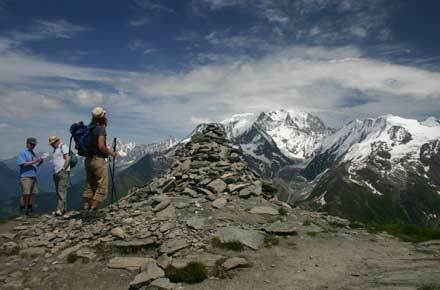 The Aiguilles Rouges to the north-west are particularly fine walking. See the Cicerone for a number of great walks. Mt Buet: an essential climb up the Aiguilles Rouges' highest summit. Refuge de la Pierre - Berand. Pointe de la Terrasse: fine one or two day trek to a gorgeous viewpoint. Cheval Blanc: Two day walk to a well known and loved but remote mountaintop. Punta della Croce: half day circuit to a very special viewpoint. Can be overcrowded at its lower sections. Mout Chetif: 6 hour slog to superb viewpoint over Mont Blanc. Mont della Saxe: tough full day slog to one of the best of all Mont Blanc viewpoints. Tete de Ferret: peak on the Italian-Swiss border. Near the TMB, with fine, wide views.